There is little debate that working smoke alarms and smoke detectors save lives. The Massachusetts Executive Office of Public Safety and Security cites that of the deaths that occurred in 2014 due to residential fires, nearly 25% of them happened in homes without smoke alarms and another 12% happened in homes with smoke alarms that were present but not working. It is likely that nearly 4 in 10 deaths would’ve been prevented if working smoke alarms had been present. These statistics have led to the expansion of smoke detection requirements in Massachusetts in residential one and two family homes. Information often gets pulled from codes and standards, Massachusetts laws, and Massachusetts regulations as if they are all applicable when sometimes they are not. Codes and standards don’t become law until they are adopted by a state. The official requirements have been increased over time, with multiple exceptions and exemptions to consider. The official requirements come from different places based on when the home was built. These factors can sometimes lead to misinformation and misunderstanding of what is required. This post is part one of a two-part series on residential fire alarm requirements and codes. With this post, we will help you make sure that your own home meets the minimum legal standards for fire protection. We will also discuss what changes have been made to the code recently, and what that might mean for your own house. If you know the year your house was built, you will know exactly what’s required for fire detection in your home by the time you finish reading this post, so let’s get started. What Do the Laws Say About Residential Smoke Alarms? State fire alarm laws generally stem from the national fire code. We will get into the creation of these codes more in the second part of this series, Understanding Smoke Alarm Requirements in Massachusetts. What’s important to understand for the purposes of this topic is that state-by-state fire detection regulations stem from national codes. Therefore, the location of your house is not the biggest factor in determining requirements. However, the age of your house does change things quite a bit. It is also important to understand the difference between a smoke alarm and a smoke detector. A smoke alarm is a device that both detects smoke and sounds a built-in alarm. A smoke detector, on the other hand, is connected to a panel and siren as part of a full fire system. The detector does not usually have its own sounder, but it detects smoke and sends a signal to the panel. From there, the system’s siren sounds and the panel create fire station response. Most code requirements deal with smoke alarms, but smoke detection systems also have their own requirements. In 1975, Massachusetts adopted its first statewide building code. For this reason, smoke alarm requirements for selling homes built during or after 1975 differ greatly from the requirements for homes built before this date. Here is a summary of the most important code guidelines regarding smoke alarm placement and maintenance in houses built both before and after 1975. Every “habitable” level of the house. This means a finished attic would need an alarm, for example. At the base of every staircase leading up to a higher story. On the ceiling outside of every sleeping area. In common areas of two-family dwellings. Alarms in these homes must also be replaced once they are ten years old. As an important aside, one device can fit multiple location requirements. For example, a smoke alarm at the bottom of the basement stairs fits both the 2nd and the 3rd requirements in this list, even though it is just one device. Likewise, if multiple bedrooms are next to each other, one detector between all of them could fit the 4th requirement as well. This floor plan shows where smoke and carbon monoxide alarms would be required for a house built before 1975. An alarm for every 1,200 square feet of living space per floor. A hardwired, interconnected series of smoke alarms with battery backup (devices in houses built before 1975 can be wireless). Before the adoption of the 1975 building code, municipalities created their own set of standards for fire alarm systems. 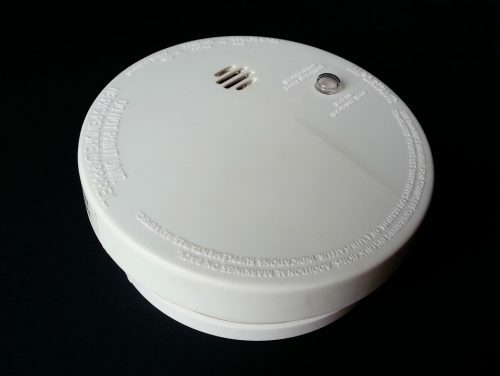 Therefore these requirements, combined with those created for houses that were already built, constitute the first set of standard Massachusetts smoke alarm regulations for new home construction. The laws in Massachusetts regarding fire protection in homes did not change much from 1975 through 1996. Then in 1997, the requirment to have smoke alarms inside every bedroom was added. This requirement is in addition to the requirement there be one outside the bedroom as well. A bit more about that decision will be included in the second part in this series, which specifically discusses the process behind changing fire codes. In addition, 2006 saw the addition of carbon monoxide protection as a requirement for new homes. Carbon monoxide detectors are required on each level, and within 10 feet of sleeping areas. Homeowners selling or renovating any house regardless of age need to add this protection before doing do. Beginning in 2008, heat alarms are now required in any garage attached to (or underneath) a home. Finally, the most recent adopted code also states that if you are selling a house built before 1975, any battery-operated alarms within the home must have a 10-year, non-replaceable battery. This ensures that the detectors are changed out every ten years going forward. It also means that the battery will not die during the detector’s 10-year life. If you have a home built before 1975 with replaceable battery operated detectors installed now, you may keep them until they reach the ten year mark. At that point, those must be replaced with detectors with a 10-year battery. 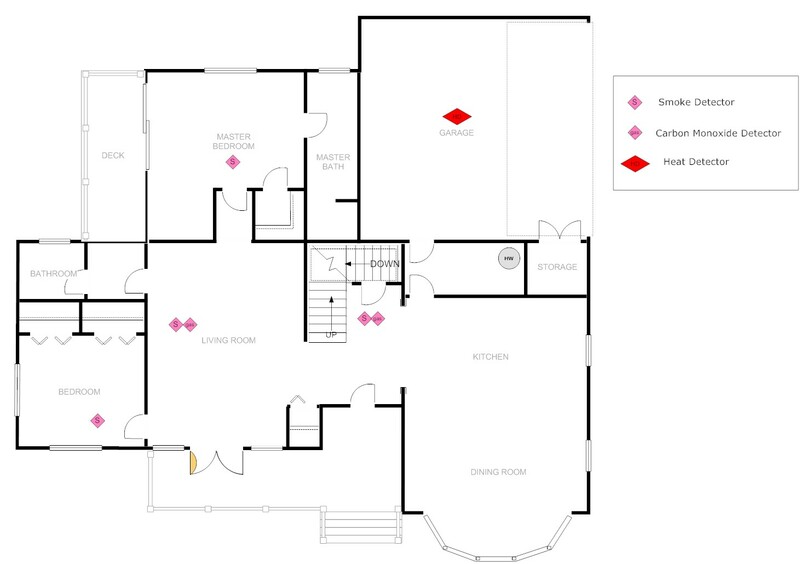 This floor plan shows the same home that we detailed before, only this time adhering to 2008 fire requirements. Note the heat alarm in the garage and smoke alarms in the bedrooms. What Changes Do I Need to Make to Stay Compliant? One of the biggest recent changes in fire alarm regulation came three years ago. In 2015, Massachusetts adopted the 2010 edition of NFPA 72. Part of this code included a mandate that home fire detection systems that are controlled through a burglar or fire alarm panel must be inspected every year by a company with the proper credentials to do so. We wrote in detail about this recent change in our Residential Fire Alarm Code Change post. If you do have a monitored fire detection system right now, make sure that you have it inspected every year to meet this requirement. You likely comply with the current laws as long as you have detectors that meet the criteria that matches the year your house was built and get your system inspected if needed. If you make a substantial renovation to your home, though, you will need to bring the house up present-day to code as if it were built today. A Massachusetts-specific law also states that the addition of one bedroom in a single-family house or two bedrooms in a two-family house also triggers a full update to present-day code. Certain events also require an inspection, but not necessarily any changes. 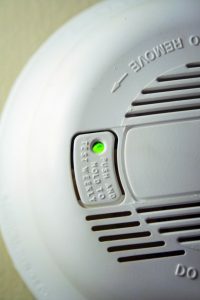 For example, if you sell your home, you will need the local fire inspector to sign off on your smoke detection system. The inspector will ensure that your fire protection devices are properly placed and maintained. He/she will also check to make sure alarms are working properly and under ten years old. As long as your system passes this inspection, you will receive a Certificate of Compliance. As you can likely guess, you cannot sell your home without this certificate. How Can I Make Sure My Home is Compliant and Safe? 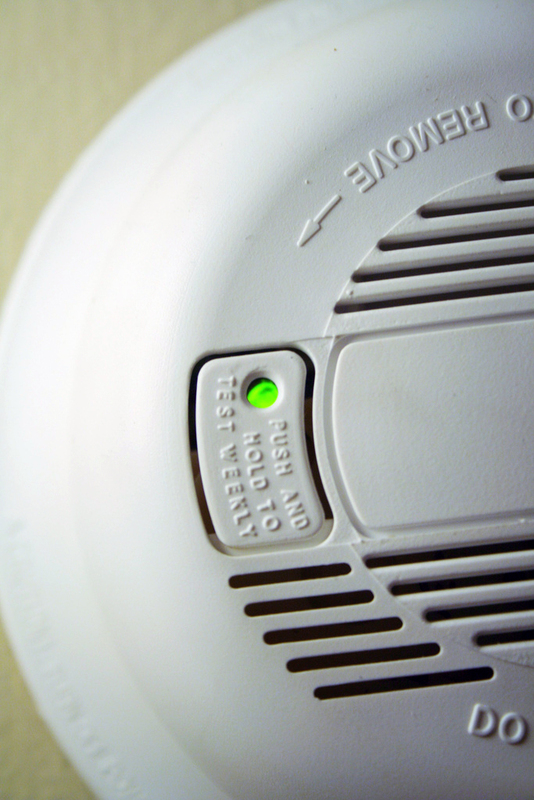 Regular testing of smoke alarms ensures that detectors are in proper working order. Photo by Alachua County used under the CC by 2.0 license. At this point, you should have a good idea of what is required for fire safety in your home. Keep in mind that codes simply dictate the mandatory minimum protection. Sometimes, just meeting the code is not always the best idea. Do you want your family protected to the minimum extent possible? Of course not. It’s always the safest bet to follow the stricter guidelines even if they may not be mandatory in your particular case. At Northeast Security Solutions, we always strongly recommend adding the best protection. We also recommend installing a monitored smoke detector system. A monitored system will notify our central monitoring station when there is a fire or carbon monoxide so we can call the emergency responders for you quickly. Remember, seconds count during a fire! You do not want to have to worry about calling 911 after escaping a fire at your home. Even more importantly, this emergency response can save your life if you are home during a fire. If you have any questions about smoke alarm requirements for your home, please do not hesitate to contact us. We will work with you to make sure that your smoke alarm system meets all legal standards and keeps you and your loved ones as safe as possible in the event of an emergency.